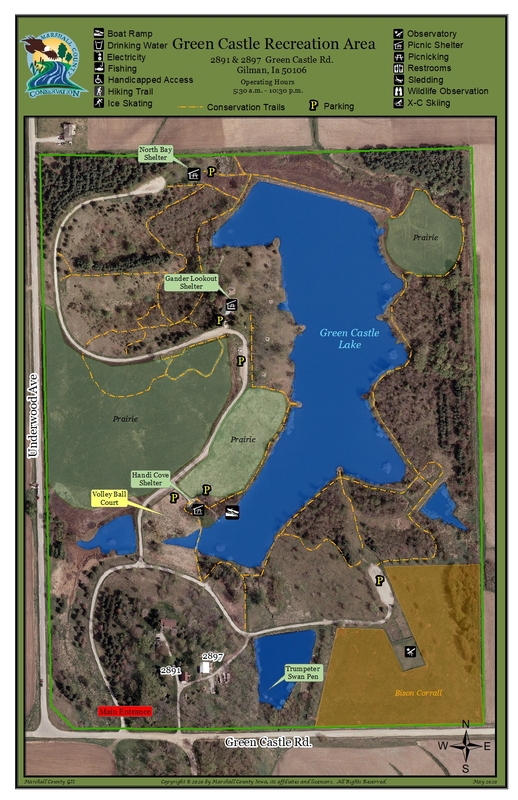 In 1977 Marshall County Conservation Board purchased a 116 1/2 acres area with a 16 acre lake now know as Green Castle Recreational Area. The rolling landscape of this area is painted with native prairie, evergreen trees, and hardwood trees. Green Castle has many day use facilities to offer including: three shelter houses (one reservable by contacting 641-752-5490), hiking trails, astronomy observatory, and a small wildlife exhibit. The lake was renovated in 2014, accumulated silt was removed, the shoreline armored with rip rap and numerous additional fish habitat structure created. The lake was restocked with bluegill, large-mouth bass, channel catfish and black crappie. This fishery will improve over the next few years. Several new fishing jetties were also constructed in 2014 as well as a boat ramp installed near the south end of the lake for easy access for canoes and kayaks. When you visit make sure that you also stop by the wildlife exhibit to see the bison and swans and check out the Amateur Astronomers of Central Iowa to see when their next astronomy event will be held at Green Castle Recreation Area. Gander Lookout Shelter Rental information Rental information for Gander Lookout Shelter.